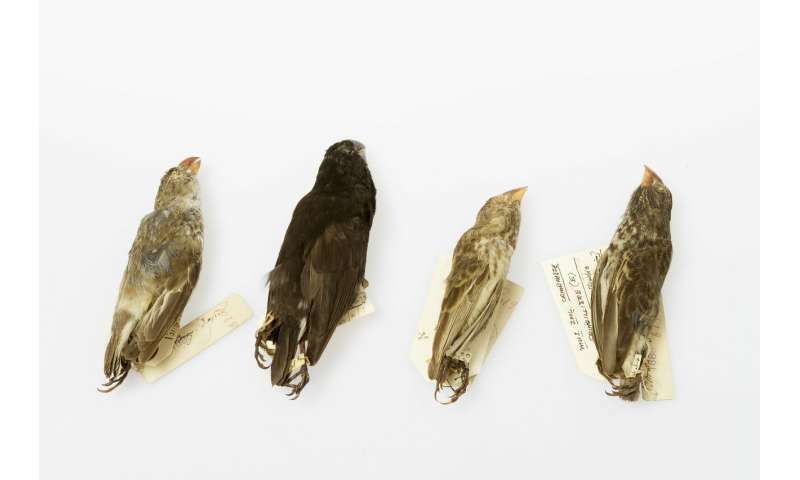 These specimens, from Cambridge University's Museum of Zoology, were collected and labelled on the second voyage of the HMS Beagle (1831-1836) that carried Darwin to the Galapagos Islands. 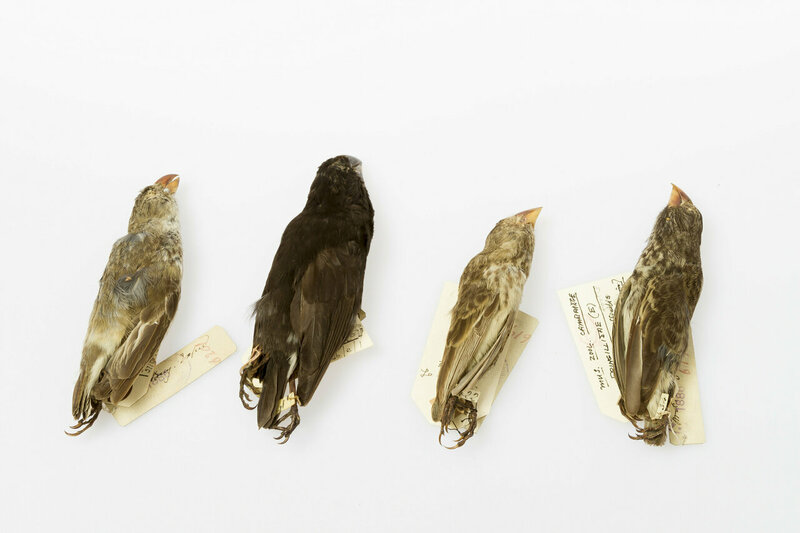 Researchers say these famously diverse finches are an iconic example of rapid speciation in a tropical hotspot. Credit: University of Cambridge / Chris Green. Some corners of the world teem with an extraordinary variety of life. Charles Darwin noted that: "The same spot will support more life if occupied by very diverse forms." The question of how these 'hotspots' of biodiversity—from California to the Galapagos—acquired such a wealth of species has long puzzled naturalists. Now, scientists at the University of Cambridge have conducted a 'big data' study of almost all the world's mammal and bird species to reveal the answer—and it's very different depending on climate. Scientists say these migrants may well have been escaping the effects of long-term "geological processes" such as vast encroaching glaciers. Warmer climes, as well as peninsulas and mountain ranges, could have offered shelter. The researchers argue that their new study, published today in the journal Science Advances, shows how these "contrasting macroevolutionary routes" have shaped the uneven distribution of species across the planet. "We've known for decades that just a subset of places on Earth, no more than 20%, contain about half of all vertebrate species. However, we lacked the tools and data to understand why these patterns exist," said senior author Dr. Andrew Tanentzap, from Cambridge's Department of Plant Sciences. In this way, the researchers were able to analyse the development of particularly species-rich areas within each of the Earth's great "biogeographical regions—from Australasia to the Nearctic. They found that biodiversity hotspots in the tropics, such as South American forests and Indonesian islands, had higher rates of "speciation—the formation of new and distinct species—over the last 25 million years. For example, speciation rates for birds in hotspots of the Indo-Malay region were, on average, 36% higher than that region's non-hotspot areas. Hotspots in the Neotropics had almost 28% greater bird speciation compared to non-hotspots. "Species generation is faster in the tropics, but we can now see it is extra-quick in these hotspots of biodiversity," said study lead author Dr. Javier Igea, also from Cambridge's Department of Plant Sciences. While the hotspots of these regions also had a wider range of resource and habitat than neighbouring areas, the data from the evolutionary—or phylogenetic—trees revealed that most of their animals "speciated" somewhere else. Igea points to species such as the Iberian lynx, now a native of the Mediterranean Basin hotspot, but found in central Europe during the Pleistocene—prior to the last Ice Age. Or the yellow-billed magpie, which became isolated in California after becoming separated from its ancestral species—most likely due to glaciations—over three million years ago. "Many of these hotspot regions have species found nowhere else on Earth, yet face devastating levels of habitat loss. Protecting these areas is vital to conserving the natural world's diversity," he said.